This tutorial shows you how to enter worksheet functions in Excel VBA. The function must be preceded by the word "WorkheetFunction" and then place "." (period). Suppose you have data in range A2:A8. You want to sum numbers entered in the range A2:A8. Suppose you have data in column A and B. You want to sum the columns of numbers. 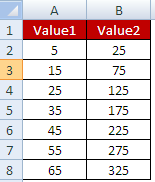 Suppose you have data in column A and B. You want to count the number of used cells in the columns. Suppose you have data in range A2:A8. You want to count the number of cells that have value greater than 20. 1 Response to "Excel VBA : Worksheet Functions"
USEFUL INFORMATION WITH REAL TIME SCENARIOS ..